Pontoons, waverunners, deckboats, runabouts, party boats, or houseboats. 9270 Old Keith Bridge Rd. 3295 Lanier Beach South Rd. 2665 Little River Park RD. 600 Thompson Creek Park RD. 154 Toto Creek Park Rd. Store/Dock hours: 9 a.m.-5 p.m., Mon.-Thurs. ; 9 a.m.-7 p.m., Fri.-Sun. Hours of operation: Office, Mon-Fri, 9 a.m.-5 p.m., marina has 24/7 access. Dock open 9 a.m.-6 p.m., Sun.-Thurs. ; 9 a.m.-7 p.m., Fri./Sat. Additional amenities: Full-service department, parts department, boat body work, yacht repair & Marine Max Stovall sales dock. Boating supplies/commissary/dry goods/retail clothing items. Hours of operation: Office/Store, 9 a.m.-5 p.m., Mon.-Fri.; 8 a.m.-5 p.m., Sat./Sun. Dock open 9 a.m.-6 p.m., Mon.-Fri.; 8 a.m.-6 p.m., Sat. ; 8 a.m.-5 p.m., Sun. Additional amenities: Repair services, detailing and bottom cleaning. Also bathroom and shower facilities are available. Hours of operation: Office/Store/Dock, 8:30 a.m.-5:30 p.m., Mon.-Thurs. ; 8:30 a.m.-7 p.m., Fri.-Sun. Additional amenities: Full Maintenance, Repair and Service on site: Harbor Marine & Associates. Bathhouse w/ locked showers and AC, laundry, pump out, trailer storage. Office/Store/Dock, 8:30 a.m.-6 p.m., Mon.-Thurs. ; 8:30 a.m.-7 p.m., Fri.-Sun. Store: Yes; Convenience items and basic boating supplies. Hours of operation: Office/Dock, 9 a.m.-6 p.m., Mon.-Fri.; 8 a.m.-6 p.m., Sat./Sun. Additional amenities: Climate controlled bath house with showers, 24/7 self-service pump out, rental boats, Courtesy dock for dry stack, two ship stores, full-service center, largest floating gas dock in Ga., 16 gas pumps. Hours of operation: Office/Store/Dock, 9 a.m.-5 p.m., Mon.-Fri.; 9 a.m.-6 p.m., Sat./Sun. Additional amenities: Club House, bath house, laundry facility and pump-out open 24/7. Location: 7000 Lanier Islands Pkwy, Buford. Hours of operation: Office, 8 a.m.-5 p.m., 7 days week; Pay at pump until dark. 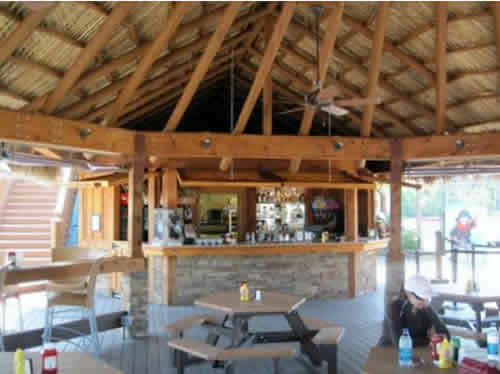 On-site eatery: Skogies – On water docking available. Additional amenities: Parts department, land service shop, recreational room, bath house, pumpout stations. Sales of new, used and brokerage boats, South Bay and Berkshire Pontoon Boats, Four Winns Deck/Sport Boats/Cruisers and Yamaha Outboard. 207 Dogwood Drive, Dawsonville, Ga.
Lanier Islands Legacy Golf course is a brilliant throwback to classically-designed courses not dependent on length to challenge golfers. It is everything great courses are known for: beautiful to the eyes, challenging to the skills and memorable to the spirit…and when you get done, you will be yearning to return! Rolling fairways, undulating greens and soft white sand—all without a house in sight to spoil the beauty of Lake Lanier. But it is the uncommon that makes this experience better. The engaging and cordial conversation with staff, attention to detail and complimentary snacks and beverages. Quiet and peaceful, teeming with wildlife, a round of golf along the lake-lined shores will leave golfers feeling like they escaped to a completely unique time and place. Chestatee Golf Club is located on GA-400 in Dawsonville, set among the North Georgia Mountains, along the shoreline of one of the most beautiful lakes in the Southeast, Lake Sidney Lanier. Golfers enjoy access to a pristine 18-hole championship golf course with brilliant water holes and vigorous mountain-like terrain. Designed by award-winning golf architect, Denis Griffiths, the golf course is one of the South’s most memorable and picturesque golfing experiences. This 18 hole, par 71 course was given a notable 4 ½ star rating in Golf Digest’s “Best Places to Play.” In 2002, it was ranked one of the top 100 courses to play in the U.S. and has continued to be distinguished in various golf magazines and publications. Featuring a beautiful clubhouse and dining facility, Chestatee offers fantastic dining in the Heron Grille with superb member events and activities. This semi-private golf club offers a great practice facility with driving range, practice green and bunker. This 18-hole public golf course was built on 183 acres of rolling farmland on the shores of Lake Sidney Lanier. The course includes two bentgrass practice putting greens, a driving range, a practice area complete with a sand bunker and a chipping green, and a clubhouse which includes a large pro shop and an excellent short-order grill. The course underwent a complete renovation in 2006, with new greens, new bunkers, added fairway drainage, cement cart paths, new modern teaching center, a fleet of electric carts, and new tee boxes with 5 sets of tees. Address: 301 Tommy Aaron Drive, Gainesville, Ga.
Northside Hospital-Forsyth continues to expand and add services to meet the ever-growing healthcare needs of Forsyth County and its surrounding communities. The hospital has more than 2,300 physicians and 2,600 employees. Northside Hospital has distinguished itself among the very best maternity and newborn hospitals in the country. The Women’s Center at Northside Hospital-Forsyth rivals the nationally acclaimed Women’s Center at Northside-Atlanta, and offers comprehensive services for labor and delivery, neonatal care, high-risk perinatal diagnostics, parenting and newborn classes and lactation consultation to Forsyth County. Peace of mind, convenience, and the latest technologies and facilities are just some of what Northside Hospital-Forsyth has to offer the community it serves. Northeast Georgia Health System offers a full range of healthcare services through its hospital in Gainesville, Northeast Georgia Medical Center (NGMC) Gainesville, which is rated as Georgia’s #1 Hospital (according to CareChex®), the #2 Hospital in the Nation and among only twenty large community hospitals named to Truven Healthcare’s list of the nation’s 100 Top Hospitals. 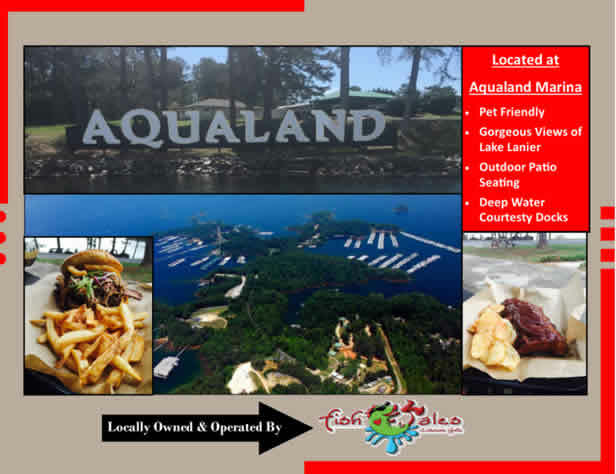 Open year round and just minutes from Holiday Marina & Lake Lanier Islands. Weekend Music starts at 8pm. Located inside Legacy Lodge at Lake Lanier Islands, BULLFROGS offers an expansive deck and inviting fire pit, an oversized six-sided bar, six flat-screen TVs, a Nintendo Wii station, and live nightly entertainment in addition to delicious food. With over 20 different beers, unmatched diversity and entertainment, and the friendliest staff in the South. 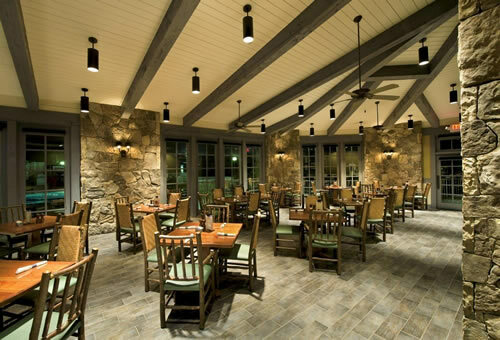 Located in Legacy Lodge at Lake Lanier Islands, Sidney’s overlooks Lake Lanier and offers a master chef’s creation of delicious appetizers, entrees, and deserts using the finest ingredients from local and family-owned farms from around the South. Sidney’s offers Legacy Lodge guests dining options for both breakfast and dinner. An incredible seafood buffet is offered on Fridays during the season. 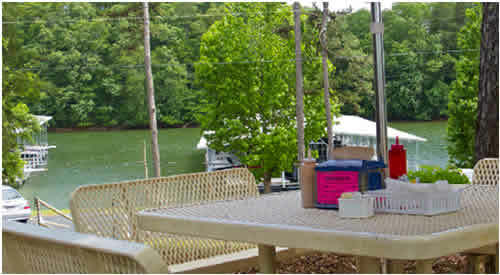 The most casual lakefront dining option at Lake Lanier Islands. Open-air eatery enjoys stunning views & lakeside breezes complemented by the smell of char-grilled burgers & the heavenly taste of nautically-inspired cuisine. Live music out in the sunshine or by the glow of tiki torches and giant outdoor fire pits. Catch your favorite sporting event on one of the flat-screen TVs. Open during season. Open Friday, Saturday and Sunday for Lunch and Dinner during the month April. Open 7 days a week starting May 1st. A place like no other on Lake Lanier. There are other restaurants but not with this view of the lake and not with the Caribbean feel. Pelican Petes offers a large variety on their menu and has a full bar. They have plenty of seating both indoor and outdoor and offer a play area for the kids. Great Barbeque! If not eating on your boat, there some booths inside, a patio dining area, and picnic tables. 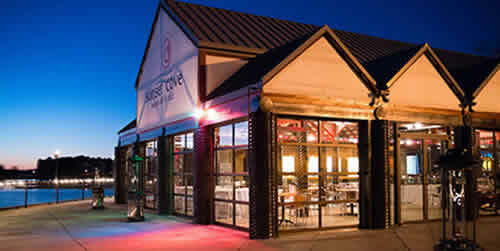 Located at Gainesville Marina, Skogies offers casual dining with live music on some weekends. 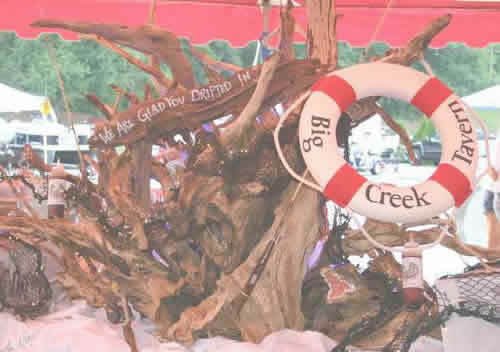 Their specialties include grouper sandwiches, slow-smoked pork BBQ, crab cakes and southern fried green tomatoes. 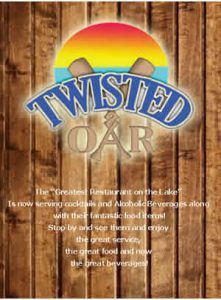 Located at Holiday Marina, Twisted Oar offers indoor and outdoor lakefront dining with a full bar, usually with live music offered on weekends and some weekdays. My wife and I just closed on our Lake Lanier lot that Jill found us a buyer for. There isn’t enough time to relate all the crazy turn of events that took place with the buyer (Jill can tell you) but Jill was a master at keeping everything on track and especially keeping us up to date with her excellent follow-up. Jill is a real pro plus we feel we have made a new friend. 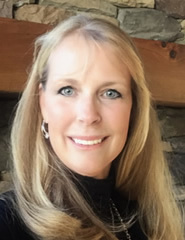 We have thoroughly enjoyed working with Jill to find the perfect property on Lake Lanier. Regardless of what property or house we asked Jill about, she had all the answers. She is the most knowledgeable real estate agent we have ever had the pleasure of working with. We would recommend Jill to anyone looking for a house or property on Lake Lanier, and have nothing but praise for Jill. In working with Jill Baugus I found her to be professional, ethical, and truly a pleasure to have known. With her background in real estate she proved to provide a wealth of knowledge in helping me secure the dream home I sought. Her enthusiasm is contagious and her commitment to the client refreshing. I would recommend Mrs. Baugus to anyone without hesitation. Jill represented my wife and I in the acquisition of our dream property and we would not hesitate to recommend her as a Realtor. Jill was extremely helpful and amazingly responsive on all fronts.